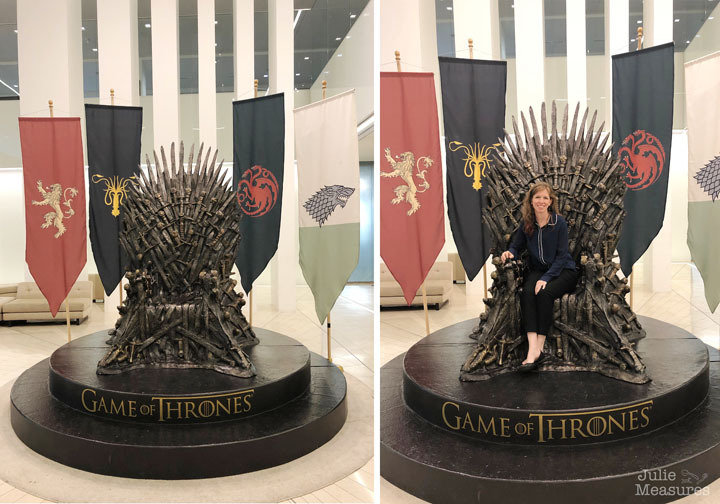 Game of Thrones fan? 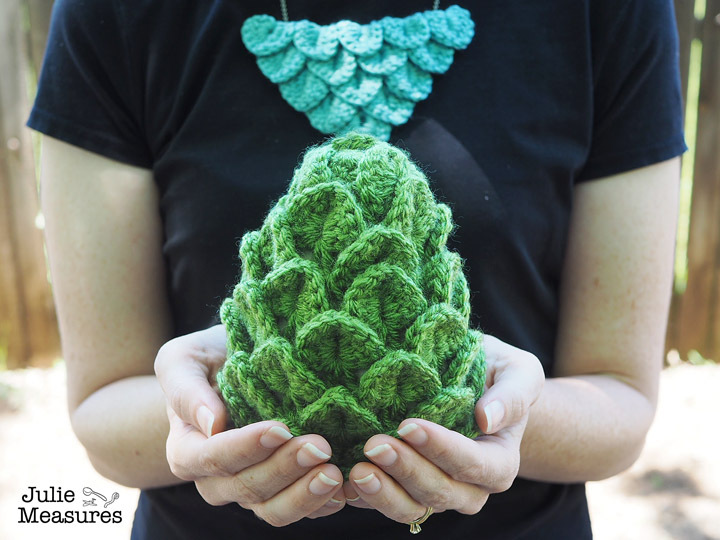 Use the Dragon Stitch to crochet a Dragon Scale Necklace or your very own Dragon Egg! Mother of Dragons. 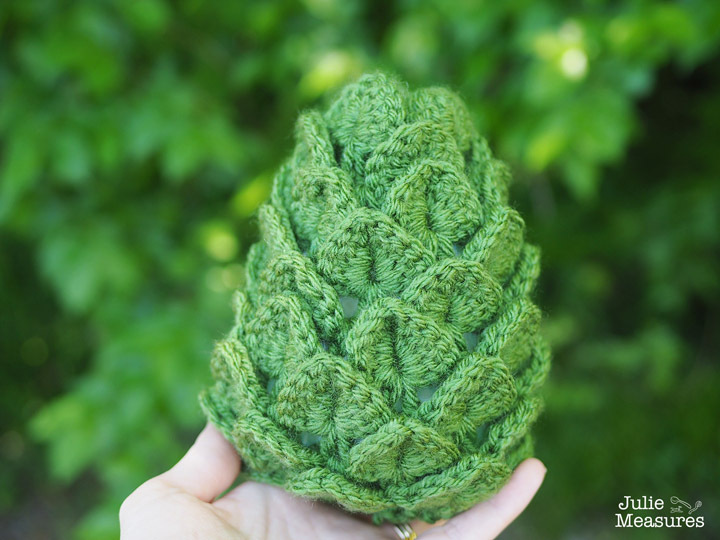 If you need a crochet project to work on during Game of Thrones (okay maybe not during, but in between episodes) this is it. 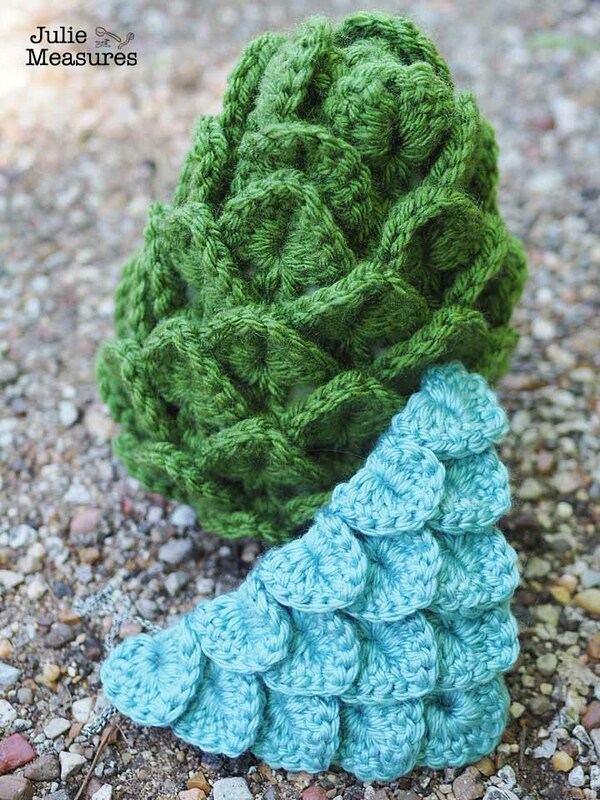 The Dragon scale stitch, also known as the crocodile stitch or dragon tears, is the perfect Game of Thrones inspired stitch for crochet projects. Each row (or round) the scales lay on top of the scales from the previous row. 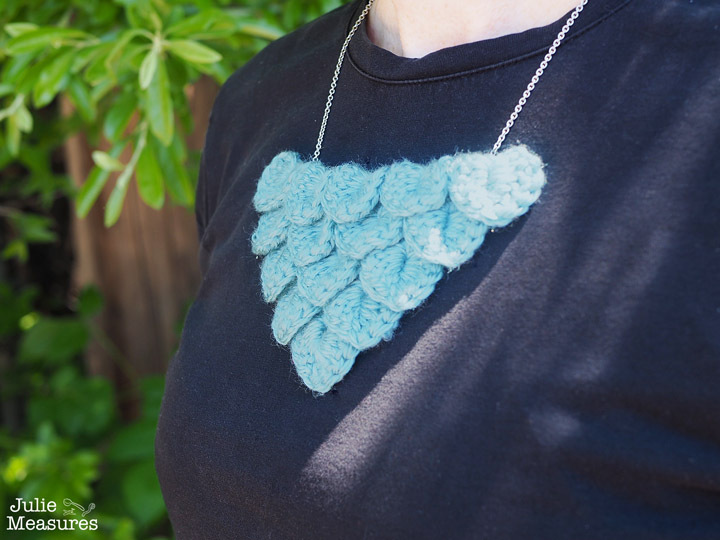 You can work this stitch flat, which is how I made the necklace, or in the round, which is how I made my Dragon egg. So my first Dragon Scale project was to crochet myself a necklace. I thought it would be a good way to practice this stitch. 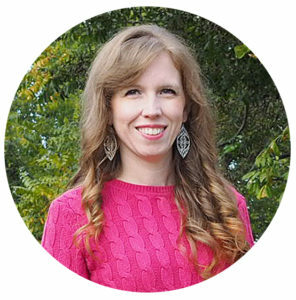 The necklace is worked from the bottom point to the top. The dragon stitch is worked using double crochets around a V stitch from a previous row. 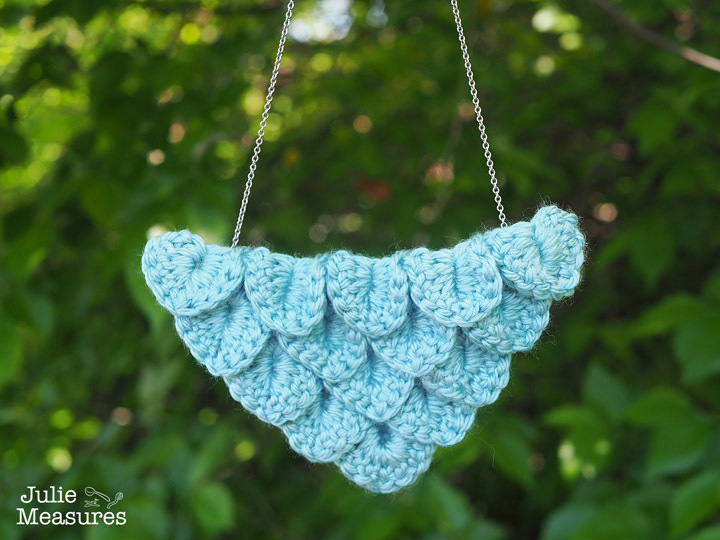 That means one row will be V-stitch and the next row will be the dragon scales – double crochet stitches. Dragon scale stitches follow a six stitch repeat. That means you need a multiple of six for your foundation row to get started. My necklace has exactly one scale for the foundation row, though I did half a V stitch, so really just a double crochet, on either side to set up the increases for the next row. 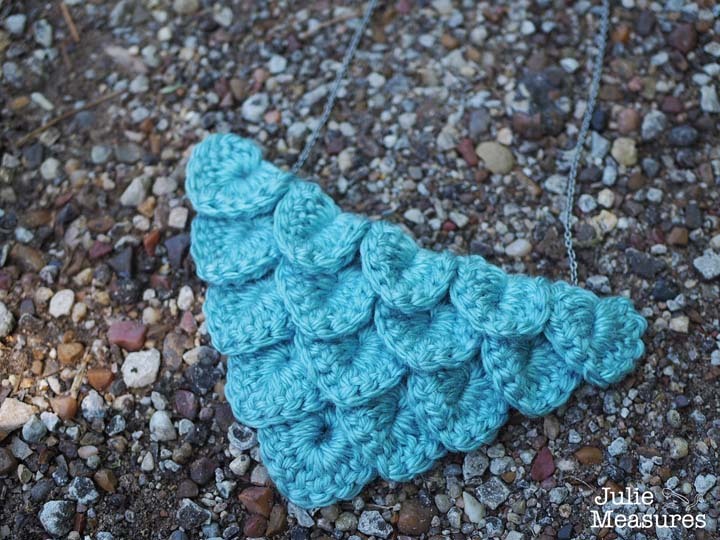 I worked 5 double crochets on each side of my dragon scale stitch, with a chain stitch in the center to help form the pointed shape of the scales. Row 1: Double crochet in 6th chain from hook (this creates the end double crochet stitch). Make a second double crochet in the same chain stitch (this creates your first V-stitch). Skip 2 chain stitches and double crochet in last chain. Turn work. Row 2: Dragon scale stitch. Working in V stitch. Make 5 double crochets down the first half of the V-stitch from the previous row. Then chain 1. Work 5 double crochets up the second half of the V-stitch. Hint: Turn your work for the second half of the stitch. Turn work. Row 3: Chain 3. Work double crochet in same stitch. Chain 1. Work 2 double crochets into center of previous V-stitch/dragon scale. Chain 1. Work 2 double crochets into the top of first double crochet from previous row. Turn work. This increases the number of V-stitches from 1 to 3. Row 4: In first V-stitch, Make 5 double crochets down the first half of the V-stitch from the previous row. Then chain 1. Work 5 double crochets up the second half of the V-stitch. Slip stitch into center of next V-stitch. In next V-stitch, make 5 double crochets down the first half of the V-stitch from the previous row. Then chain 1. Work 5 double crochets up the second half of the V-stitch. You now have 2 dragon scales. Repeat Rows 3 and 4, increasing the number of V-stitches and dragon scales each time. 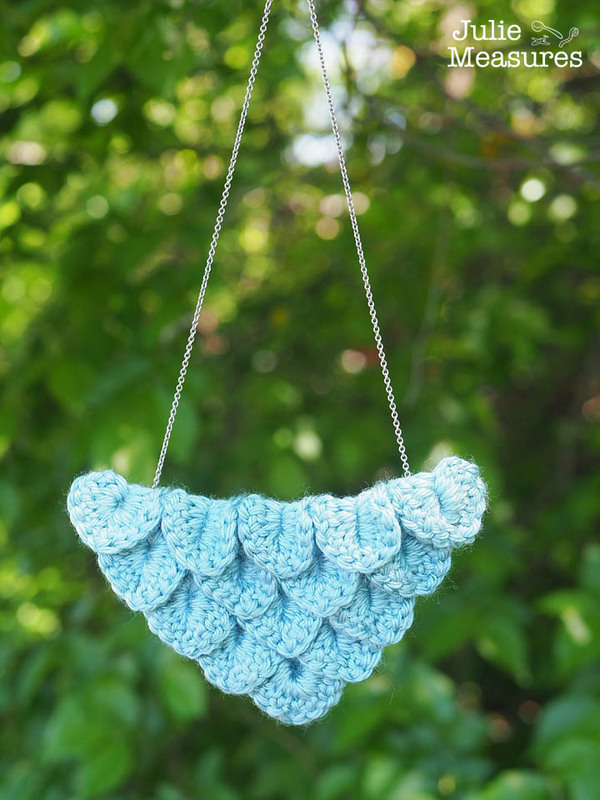 I finished my necklace with a total of 5 dragon scales, but depending on yarn and hook size you might prefer a different sized necklace. 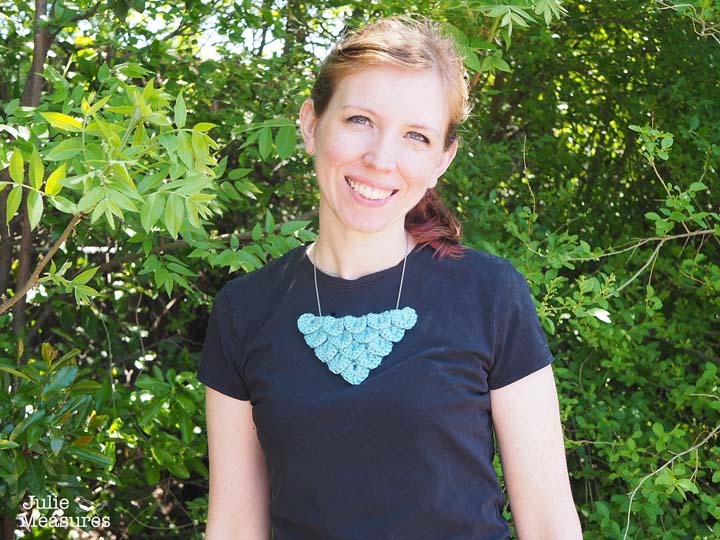 Be a Mother of Dragons and rock your new Dragon Scale necklace! 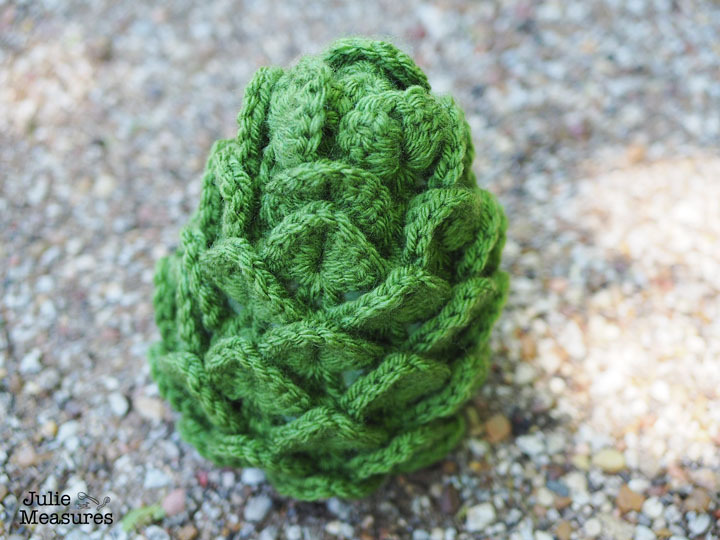 Of course, any crochet dragon crafting, inspired by Game of Thrones, wouldn’t be complete without a dragon egg. While my dragon scale necklace was worked flat, my dragon egg is worked in the round. I tested my dragon egg two different ways, starting at the bottom of the egg and working towards the top and starting at the top of the egg and working toward the bottom. Because of the way the stitch works you get scales that point down or scales that point up. I thought I would prefer the scales that point down. 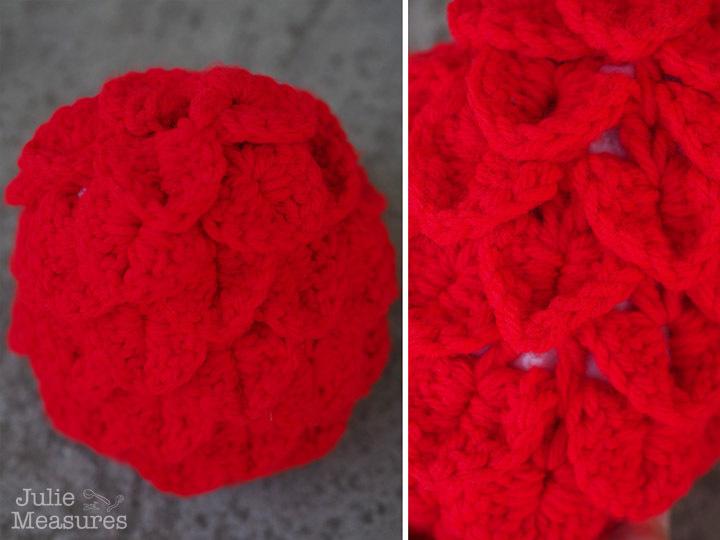 I tested them by crocheting this red dragon egg. However, to get the egg shape, you work several rows of decreases as you move from the larger bottom portion of the egg toward the top. I didn’t like how visible these decreases were. So I switched to working the dragon egg from the top down. Here I’m making increase rows and I like how the scales overlap much better. Round 1: Single crochet 9 stitches into the magic loop. Round 4: V-stitch round. V stitches need to be worked in the same places as the slip stitch and the center of the dragon stitch from the previous round. However you also need to increase 1 dragon scale. In order to increase 1 dragon scale you need to add 2 sets of V stitches. I added my increases on either side of a slip stitch from the previous round while still placing a single V-stitch in the center of the dragon stitch from the previous round. These increases can be added anywhere throughout the round. Finish this round with 8 V-stitches. Round 6: Increase V-stitches. Intersperse the increases as desired, finishing the round with 10 V-stitches. Round 8: Increase V-stitches. Intersperse the increases as desired, finishing the round with 12 V-stitches. Round 10: Work V-stitches, keeping the number the same as round 8. Place your V-stitches within the slip stitch and center of the dragon scale from round 9. Finish with 12 V-stitches. Round 12: Increase V-stitches. Intersperse the increases as desired, finishing the round with 14 V-stitches. Round 14: Work V-stitches, keeping the number the same as round 12. Place your V-stitches within the slip stitch and center of the dragon scale from round 9. Finish with 14 V-stitches. Round 18: Single crochet around, 28 stitches. This is a good time to stuff your dragon egg, before you work the final few decrease rounds. Round 19: Single crochet 2 stitches together, single crochet next 2 stitches. Repeat around. 21 stitches. Round 20: Single crochet 2 stitches together, single crochet next stitch. Repeat around. 14 stitches. Round 21: Single crochet 2 stitches together. Repeat around. 7 stitches. Fasten off leaving a tail. Use tapestry needle to sew up hole. 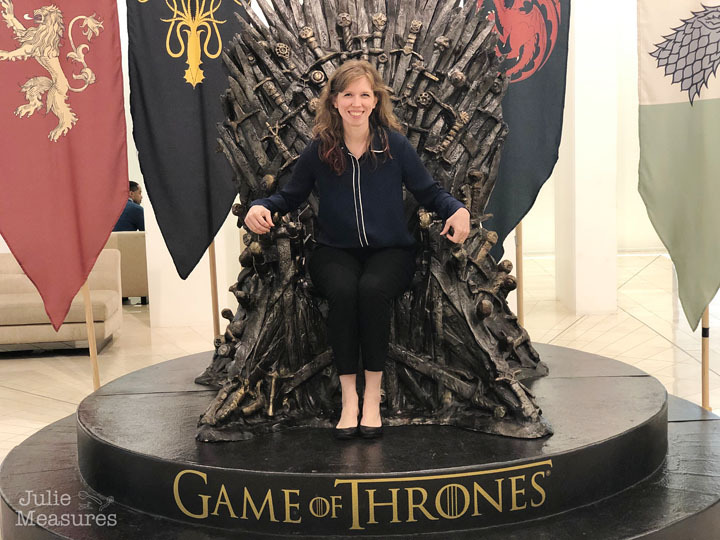 If only I would have had my dragon egg with me when I was sitting on the Iron Throne! Ready for some dragon inspired crafting? More dragon stitch tutorials and a video are coming soon!